Day 1: Madrid is central to Spain, geographically as well as the financial capital. It is a city that is small, with all sights within walking distance, yet large in grandeur, history and culture that it will require many days to experience it all. We only had 3 so made the most of it. When in Madrid, it is essential to stay in the city center, close to Puerto del Sol, and Hotel Atlantico was just that. After checking in, and getting brunch, we decided to head to the Royal Palace. Our first stop, was Puerto Del Sol, a plaza since 1570, and the place in Spain from which all distances are measured. The headquarters of the regional government is on the south side of the plaza and during all times of the day, this is the place to people watch. Street performers, unlike any we’ve seen, Disney characters, the hip young crowd, the locals and the tourists all congregate here. We followed Calle Arena toward the opera house, Teatro Real, and then behind it, was the Plaza de Oriente, leading to the Palacios Real de Madrid, the Royal Palace of Madrid. One of the grandest, and most opulent palaces we’ve seen, each room is designed differently, with one completely being done in ceramic. After a fire destroyed the original building, in the 18th century, Francisco Sabatini began to rebuild and expand. The current structure was completed in 1764. Since 1931 the building has been used occasionally for state receptions. Behind the palace, is Campo del Moro, a very peaceful garden. Across the plaza from the palace is the Cathedral de la Almudena, a beautiful cathedral, with stunning stained glass windows and colors that have only gotten brighter over the years. We grabbed food at a café overlooking the palace and with the glass of sangria, life seemed perfect. We took Calle Mayor back toward the city center, stopping at Plaza de la Villa, which served as the town square till a few years back. Around the plaza is the Gothic Torre de los Lujanes, a 15th century structure, the Casa de Cisneros, a restored 1537 Plateresque-style palace and the Casa Consistorial, which was the meeting place for the town council from 1640 till 2008. One block away, is the Mercado de San Miguel, a market where the young tourists hang out, and the wine flows freely. 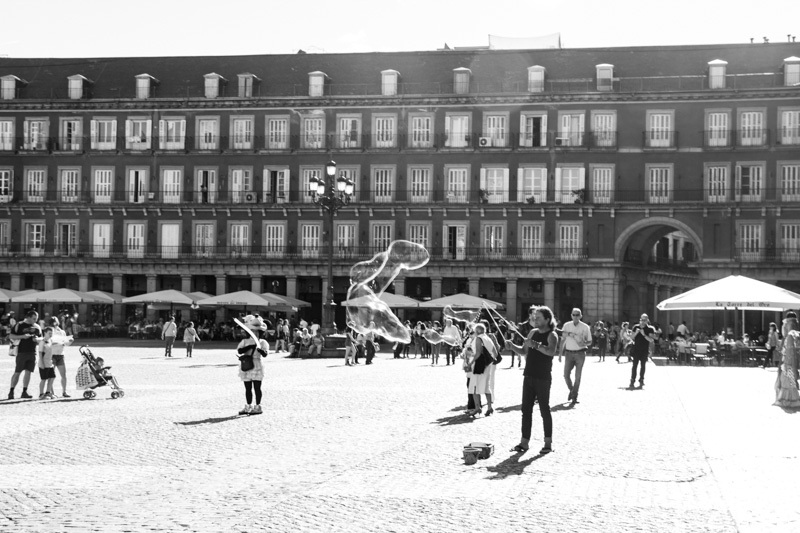 Another block away, is Plaza Mayor, one of the most dazzling public squares in all of Europe. The plaza was used for bullfights and proclamations and has also served as the public scene of executions during the inquisition. The current façade was designed by architect Juan De Villanueva. The plaza is a great place for cafés and shopping. We ended the day, winding our way back through Puerto del Sol and to our hotel. Day 2: If you are in Spain on a Sunday, then start the day walking through the Sunday flea Market at the El Rastro area. A large gathering of vendors, selling souvenirs to fruit, this is a perfect way to begin the day and experience the vibe of the Madrid. El Rastro de Madrid or simply el Rastro is the most popular open air flea market in Madrid (Spain). It is held every Sunday and public holiday during the year and is located along Plaza de Cascorro and Ribera de Curtidores, between Calle Embajadores and the Ronda de Toledo (just south of La Latina metro station). We started at the top of the hill, at the statue of Eloy Gonzalo, and walked down the hill. Less than 2 kilometers away is the Musso National Centro de Arte Reina Sofia, Queen Sofia National Art Center, which is home to Picasso’s Guernica, a symbol of antiwar sentiment. The museum houses many of Pablo Picasso’s paintings along with prominent works by Salvador Dali and Joan Miro. The museum has been renovated with modern, exterior, glass elevators that take visitors to the three floors. We ate lunch at the museum. When you travel with a 2 year old, it is essential that after 4 hours at a museum, you dedicate the rest of the day to her, the Madrid Zoo was perfect. The Madrid Zoo Aquarium is a 20-hectare (49-acre) zoo and aquarium located in the Casa de Campo in Madrid, Spain. A well laid out zoo, exhibits included the Panda, and an excellent collection of lizards. For dinner, we found an Ethiopian restaurant that served great injera. Day 3: Our big task for the day was to see the Museo del Prado, the Prado Museum. The museum has an unrivaled collection of Spanish paintings and is one of the most renowned art museums in the world. The museum has over 18000 paintings in its collection, though only a fraction are displayed at any time. Highlights include Diego Velazquez’s Las Meninas, often thought as one of the finest paintings in the world. The scale, the imagination, the story, it truly captured our breath. Francisco Goya’s work also occupies many rooms, with his dual painting of the Duchess of Alba, Majas, being a highlight. The museum requires many days of personal time but in four hours be sure to follow the paths to all the major paintings. Lunch again was at the museum. Behind the Prado, is Iglesia de San Jeronimo el Real, St. Jerome the Royal, the royal church. King Alfonso XIII married Queen Victoria in 1878 here. King Ferdinand rebuilt the church in 1505 for his queen Isabella. Continuing on, we reached Parque del Retro, Retiro Park, a garden surrounding the Buen Retiro Palace. The park was built in 1630, in French style. Within the park is the statue of Alfonso XII, and the Palacio de Cristal (Crystal Palace) along with a beautiful rose garden. The light was perfect, the skies were clear, and the flowers were fragrant. Perfect for romance, and perfect to stroll through at a pace much slower than what is required to see Madrid in 3 days. For dinner we headed to El Estragon, a vegetarian restaurant that served excellent paella. Madrid is an historic city, yet, it is building itself a future without destroying its past. While the façade stays the same, the mechanics within the city, the buildings, the people and the culture keep on becoming modern.